How to Reset Your Adrenals. Dr. Alan Christianson — author of The Adrenal Reset Diet — stops by to discuss how you can use food to transform your adrenals from surviving to thriving. 2:15 – The “chubby kid”. Dr. Alan’s adolescent weight issues … and how he got past them. 4:09 – Surviving vs. Thriving: which mode are you in? 7:49 – Cortisol is your friend. Here’s why. 11:09 – Why a low-carb diet may be keeping you up at night. 14:05 – The Adrenal Fat Switch: How to turn it OFF! 16:06 – Carb Cycling: WHEN to eat carbs and why. 18:35 – The Cortisol Slope: You’ll never believe what it can tell you about your lifespan! 19:38 – Dr. Alan’s personal Adrenal Reset experiment. 23:06 – How to shift your cortisol levels with diet alone. 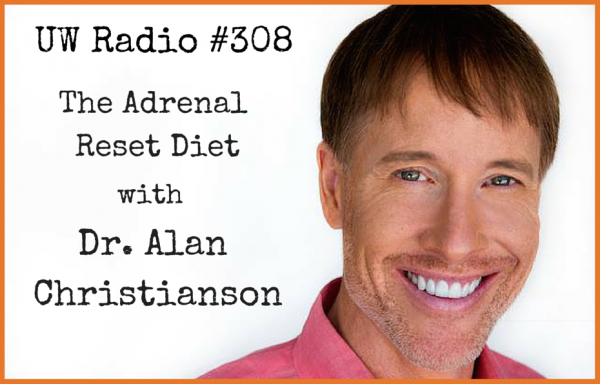 29:20 – The Adrenal Reset Diet in a nutshell. 36:28 – Don’t let your stress get you stressed! 40:00 – Get The Adrenal Reset Diet. This entry was posted on Monday, December 22nd, 2014 at 11:38 am and is filed under podcast, wellness. You can follow any responses to this entry through the RSS 2.0 feed.